CHULA VISTA – County Supervisor Greg Cox will host a free event Saturday for grandparents who are raising their own grandchildren. 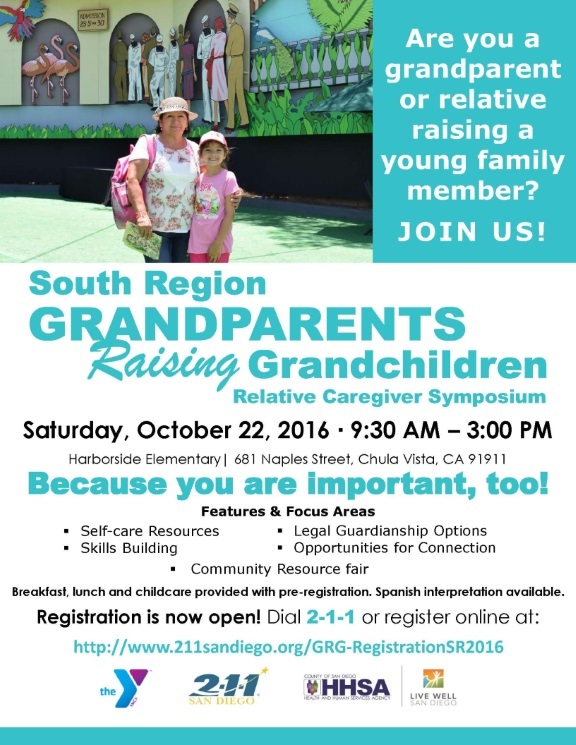 The South Region Grandparents Raising Grandchildren symposium is for grandparents or relatives raising a young family member. It will be from 9:30 a.m. to 3 p.m. at Harborside Elementary School, 681 Naples Street in Chula Vista. The event will provide resources, skills building, legal guardianship options, a career resource fair and opportunities to talk to other caregivers and learn from their experiences. Breakfast, lunch and childcare will be provided. Spanish interpretation will be available. Registration for the event is available by dialing 2-1-1. Supervisor Cox launched the Grandparents Raising Grandchildren initiative to after noticing a growing problem of grandparents suddenly forced to raise their own grandchildren and navigate a maze of challenges and issues they weren’t prepared to handle. “This event will give grandparents and others the tools and assistance they need to help raise their families,” said Cox.